Summary: Princess Adele struggles with a life of marriage and obligation as her Equatorian Empire and their American Republic allies stand on the brink of war against the vampire clans of the north. However, the alliance's horrific strategy for total victory drives Adele to abandon her duty and embark on a desperate quest to keep her nation from staining its hands with genocide. Reunited with her great love, the mysterious adventurer known to the world as the Greyfriar, Adele is pursued by her own people as well as her vengeful husband, senator Clark. With the human alliance in disarrray, Prince Cesare, lord of the British vampire clan, seizes the initiative and strikes at the very heart of Equatoria. My review: If I was stuck on a deserted island and could only have one vampire book series with me, my choice would be the Griffith's Vampire Empire saga (my review of the first book, The Greyfriar, is here). Bye Lestat, farewell Edward, as a longtime vampire book fan Greyfriar simply does it for me. There is no sophomore slump evident within the pages of The Rift Walker. The husband and wife team of Clay and Susan Griffiths continues the war between the humans and vampires, upping the stakes between the two factions, and then adding in so much more. Princess Adele matures into a confident, secure young woman, the next ruler of Equatoria. As her people read books and watch plays depicting the romance of their princess and the dashing Greyfriar, both characters humorously reference their taboo relationship throughout their adventures. The Griffiths' slowed the pacing in sections and still kept me riveted by crafting an intense story with elements of steampunk, history, undying love, and science. Non-stop action is fine as long as I understand what's going on and the way the authors blend action with learning, unveiling information, while adding more depth to characters and their storylines, fills in any questions I may have without taking away from my enjoyment. Special mention must be made for the authors' love of language--so apparent in every passage on each page--which only heightened this reader's literary enjoyment. As a fan and staunch supporter of words and grammar, I must applaud them. Adele's further studies into geomancy and that amazing power she has yet to control is fascinating to both read and watch unfurl. Her wedding scene to Senator Clark brought back the grandeur and excitement of Errol Flynn movies as Greyfriar breaks windows to sweep in and grab the woman he loves. And he remains by Adele's side for the rest of the book, much to my utter happiness. Whereas The Greyfriar was more of Prince Gareth's story, The Rift Walker really spotlights the Princess. Gone is her meekness of expressing her beliefs to the men of power in Equatoria. Here she stands up for herself and her people while she thinks and plans out her next move. By the book's end, Adele becomes quite the political and revolutionary figure, but along the way her travels bring her face-to-face with allies and more danger. The scene on the bridge in Katanga was thrilling and watching Anhalt defend his beloved princess was touching beyond words. I was thrilled to see secondary characters I liked from the first book--Captain Anhalt and Adele's teacher, Mamoru--have more of a presence here. Anhalt's unyielding dedication to his princess is admirable even when he learns her secret. Mamoru's staunch prejudice of everything vampire, his underhanded actions, and his sneaking ways have made me really wonder where his true alliance lies. I suspect both men will have even more to do in the next book. By this book's end, another character is introduced, increasing the mystery as well as my wait for the third book and the impending showdown between Prince Cesare, Flay, and the humans lead by Adele, Greyfriar and a slew of others. I don't usually gush over books but I loved The Rift Walker, love this series, and cannot wait to see the movies. Instead of Hollywood trying to wrestle another dumb installment from a tired franchise, why not tackle a unique series such as this? Thank you to the Griffiths for fueling and continuing my love of vampire novels. 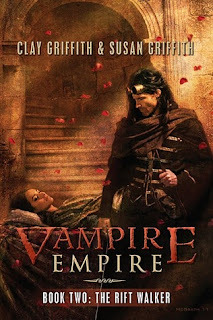 All I can say is is it September yet so I can get lost in the third Vampire Empire novel? Rating: 4.5 stars. Loved it! Favorite excerpt: "When Gareth crawled over the top of the cliff, he was slapped by the smell of death. It was not the mundane metallic sting of blood or musk of human fear. This was different. He could taste it, and the fear he smelled was his own. Through the wind-ripped fog, Gareth spotted the trapped humans in the distance. Msiri, Anhalt, and numerous Mountaineers were surrounded by dead and wounded, both human and vampire. The Katangans were vastly outnumbered. The ropes the troopers had used to traverse had snapped and the treacherous rope bridge was shredded. Soon the murderous ndoki would winnow the humans to nothing. In the midst of the chaotic battle, Adele was no longer fighting. She knelt with her hand on the ground. Gareth smelled the heat pouring off her and felt it in the earth under his knees and hands. His skin tingled with flame, just like it had when Adele prayed in Edinburgh and dreamed over Nabta Playa. Cover comment: This cover depicts a scene from the book which I won't reveal. Love the color, Gareth's gaze on the slumbering Adele and the stone steps in the background. Their journey together has taken them to many places and through much and yet it is not over. How can the cover artist top the first two? We'll have to wait and see. Book source: ARC requested by me and then provided by the publisher for my totally honest review. I thank Pyr Books.